Look down at your feet. How many arches do you see? One? Two? Foot Levelers individually designed Stabilizing Orthotics support the more than 26 bones, 33 joints, and more than 100 muscles, tendons and ligaments in your foot. 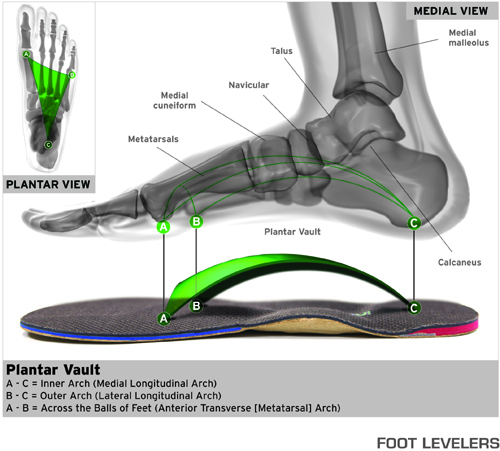 Stabilizing Orthotics maintain the structure of the plantar vault to balance the entire body. Over-the-counter orthotics support only one arch in your foot. When only one arch is being supported the problem shifts to another part of your body. Foot Levelers Stabilizing Orthotics focus on improving your overall health. They offer more than just short-term symptom relief. Set up a consultation with one of our Doctor's to Know the Difference!! !